Polly #24 in Vietnam, from the DMZ to Hanoi. We didn’t get to see a whole lot from the middle of Vietnam, where the DMZ is, until we got into Hong Kong as Scott came down with a bit of a travel bug (he’s much much better now though). We did manage to see some very interesting architecture and a very important area in Vietnamese recent history!! After this we head to Hong Kong and China!! Can’t wait! 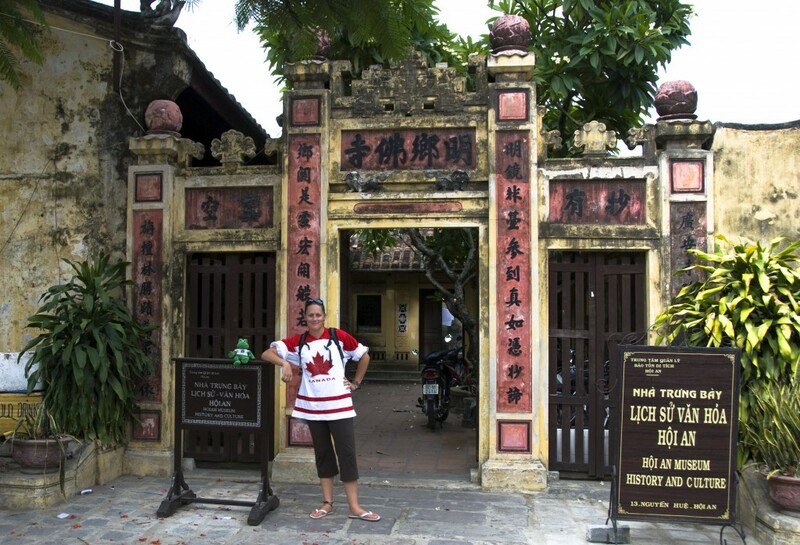 Kristy and Polly in front the history and culture museum in Hue, Vietnam on Canada Day. the old town in Hue was a world heritage sight because of the many fascinating and well-preserved buildings from the past few hundred years. Polly in one of the 'Hospital wings' of the Vinh Moc Tunnels just outside the DMZ in Vietnam. The inhabitants of a near-by village built an elaborate tunnel network during the war in the 1960's and 1970's to hide from the invading troops. Polly in front of a memorial statue in the middle of no where, commemorating the efforts of some brave female soldiers. 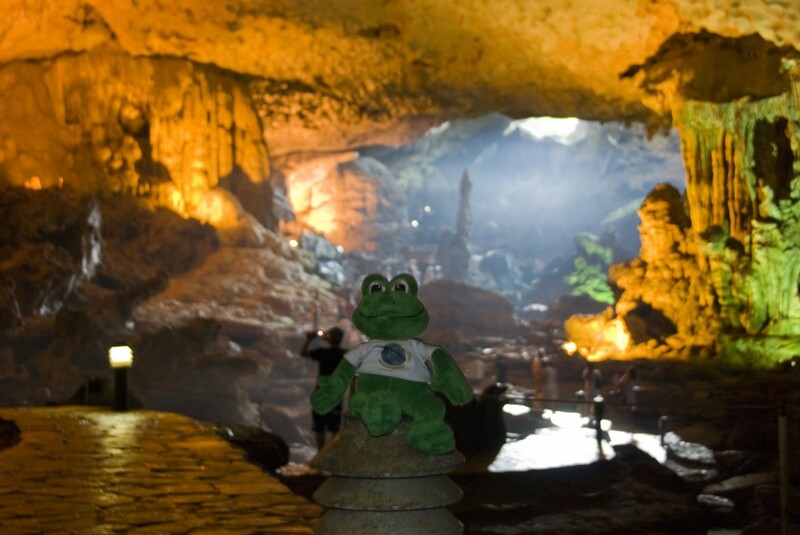 Polly in a gigantic cave in Halong Bay, Hanoi. We took an overnight boat to see thes caves. I’ve been following your travels through the use of Polly 24. I think the experiences you’re having are amazing and you’re going to have many wonderful memories. All of your posts are great. A couple of weeks ago, I was watching Destination Truth on the SciFi Channel, and they were investigating the (alleged) hauntings at Angkor. All of a sudden, that tree you took a picture of (in an earlier post) was there on the TV screen. It was like, “Hey, I’ve seen that before!” As for this post, the cave is absolutely amazing. Thanks for all of the great pictures and information. Wow, another great post! 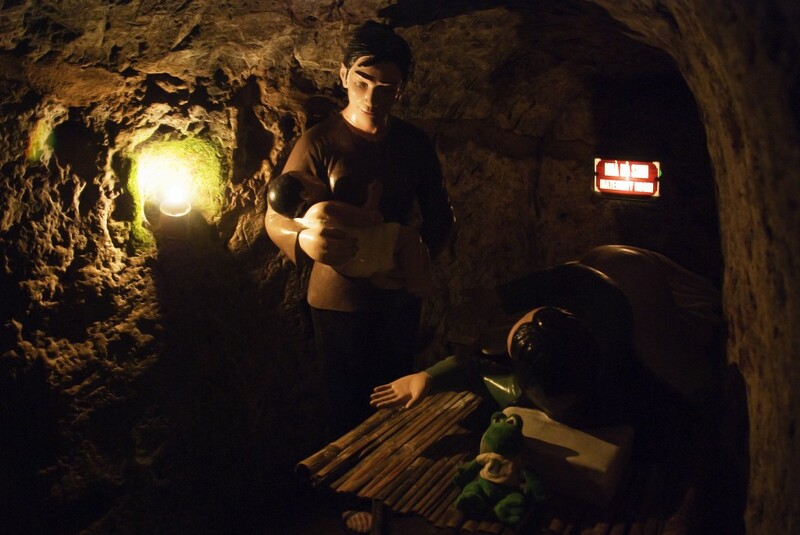 I bet it was very interesting to see the Vinh Moc Tunnels. How much of it was available to tour? Hauntings at Angkor. eep! I’m glad we didn’t run into any ghosts. There were a lot of creepy long dark tunnels that we didn’t venture down though. haha. 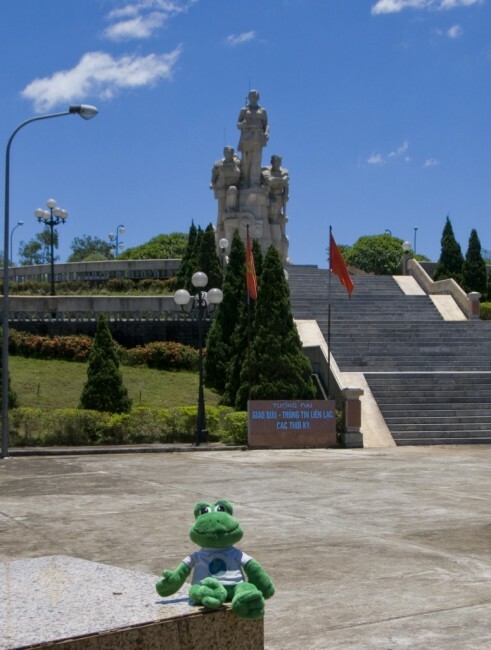 The Vinh Moc Tunnels were super interesting, a bit short for us so we were walking around hunched over, but Polly was able to hop right through no problem!! Most of it was available, the only part we weren’t allowed to see was the deepest third level as it was a bomb shelter, slide down only, no stairs up. The tour was very interesting though. The woman told us all sorts of things about the tunnel, how the people lived there for three years, and the longest time they spent fully underground was 10 days I believe. They usually came up during the day to farm and fish for food. Love your shirt…no doubt where you’re from! 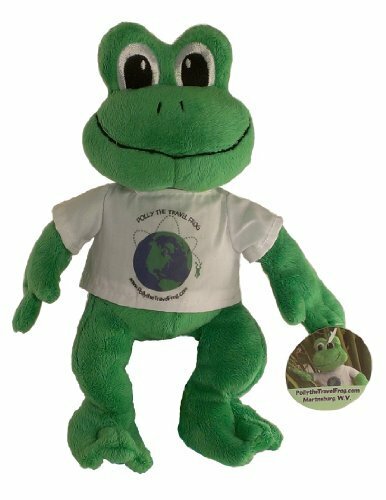 Do you get a lot of comments or questions from people when you wear it during your travels? I bet it was a very sobering experience to be in the tunnels that were occupied during the world. It’s something that I can’t and don’t want to even imagine, yet it happened to so many people. Thanks for posting. The second picture looks scary. When you were there were they scary?